The darker brown thatch layer in this image is almost 2 inches thick. The thatch layer under this lawn is about an inch thick and can be seen as a lighter brown color. What Grasses Produce Rhizomes and Stolons? Dry Spots Form Thick thatch layers can dry out during the summer and become nearly impossible to re-wet; therefore, water doesn’t reach the soil. Grass growing in these irregularly shaped areas then dies out. 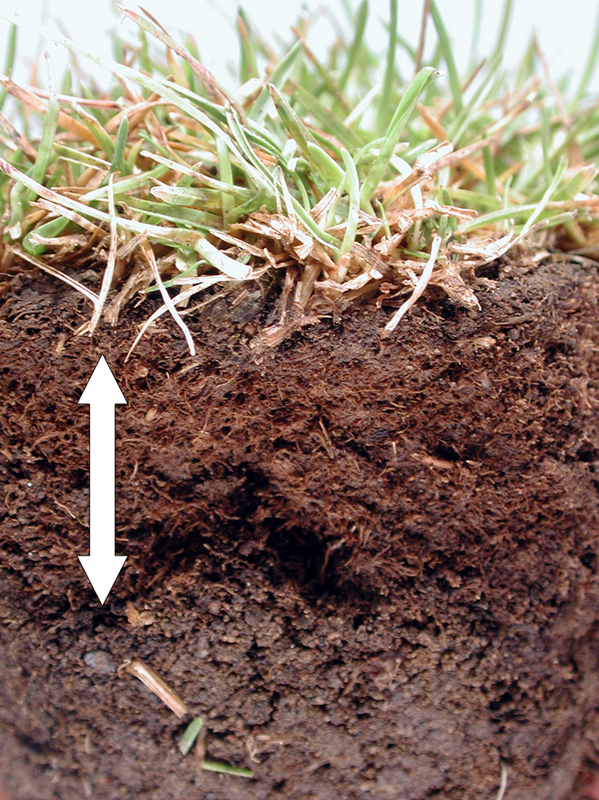 Scalping Increases Grass plants growing in thick thatch produced by stoloniferous growth have crowns elevated above the soil. When a mower passes over them, it sinks into the thatch and scalps the lawn, leaving brown stubble showing. Scalping is mostly an aesthetic problem. Tolerance to Adverse Environmental Conditions Decreases Most of the living part of the plant is not in soil, so it doesn’t have earth’s insulating capacity. Plants growing in thatch are more susceptible to cold and heat injury because temperature fluctuations are greater in thatch than in soil. Different grass species accumulate thatch at different rates. 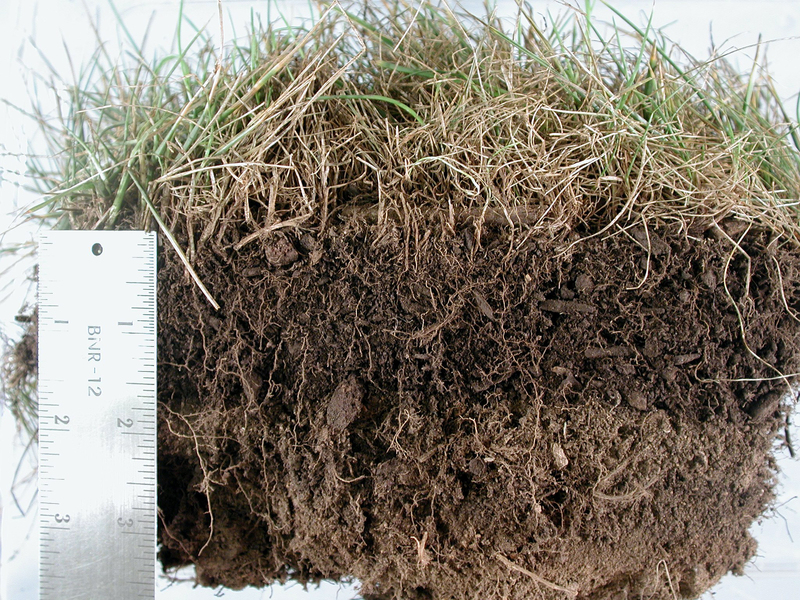 Perennial ryegrass is a low thatch producer; bluegrass and fescues, because of their lateral growth, form a dense thatch that is difficult to remove. A layer of 0.5 to 0.75 inch is generally acceptable in home lawns, but anything greater can begin to cause problems. Once a thick layer of thatch has formed, it must be removed by vertical mowing. Use a machine that has rigid or flexible blades or tines (power rakes) that cut into or pull turf out of the soil surface. You can rent a power rake, or you can hire a professional lawn service to do the job. Attachments to your lawn mower are not as effective as true vertical mowers; these attachments may be hazardous to both you and your mower. Set the blades of the power rake approximately 0.25 inch above a hard surface such as a sidewalk. Then, in the lawn, move back and forth over the lawn, maintaining a slow steady pace. After going over the entire lawn, rake up the debris and determine whether the lawn can tolerate another pass. Normally, three separate passes in different directions are enough to thoroughly dethatch healthy lawns. When you start tearing chunks of turf out of the ground, it is time to quit. If you have to re-seed after dethatching, you removed too much live plant material. If thatch is more than 1 inch, don’t try to remove it all at once. It is better to make several passes and then wait to dethatch again another time. The time to dethatch in western Oregon is spring or fall, which usually means mid-March through early May, or mid-September to mid-October, weather permitting. Dethatching during these times will allow the grass sufficient time to recover before stress of summer heat or winter cold. April generally is the optimum month to dethatch in central and eastern Oregon. After dethatching, always fertilize with at least 1 lb nitrogen per 1000 sq ft; water in the fertilizer thoroughly to speed recovery. Dethatching without follow-up fertilization results in increased weed encroachment and ugly turf. How Often Does Dethatching Need to Be Done? Once a thick layer has been removed, dethatching every year or every other year will ensure a healthy lawn that is easy to manage. Dethatching is less disruptive and a lot less work if it is done regularly. People who dethatch only after a severe thatch layer builds up usually destroy their lawns. How Can Thatch Accumulation Be Prevented? If your lawn is healthy, it naturally will produce thatch consistent with the type of grass you are growing. Thatch should be viewed as inevitable and desirable provided it isn’t too thick. Learn to think in terms of managing thatch rather than trying to get rid of it completely. With this in mind, consider the following tips to help avoid encouraging too much thatch. Avoid over-fertilizing your lawn. The idea is to fertilize enough to provide a nice green lawn, but not so much that extra mowing is needed. Mow frequently enough so that only one-third of the grass blade is removed at any one time. Normally, once a week is fine, but in spring when growth is vigorous you may need to mow twice a week. Removing clippings will have little effect on thatch development, but it will force you to fertilize the lawn more often. Leaving the clippings on the lawn will not contribute to thatch accumulation unless you also apply excess nitrogen fertilizer. “Wonder amendments” such as bacteria, yeasts, enzymes, and other “miracle cures” have no significant effect on thatch accumulation. Natural decomposition will occur from the organisms that are already in your soil when the lawn area is well drained and the soil pH is neutral (between 6 and 7). If your soil is acidic, periodically apply lime to help bring it up to neutral.